The PLMAM might have an ugly acronym, but it is a great opportunity for researchers such as ourselves to meet policy makers of sending and receiving countries, employers, interested activists and journalists, and of course other researchers. The meeting was full of interesting people and presentations, and a terrific learning experience. The PLMAM currently straddles two approaches: a formal and an informal one. Most of the two-day conference was taken up with a variety of interesting presentations by sending countries, receiving countries, and a few employers and employees. There were numerous interesting insights provided, of which we single out the following five. One was the number of countries in the process of developing labour mobility strategies, including the two biggest senders, Vanuatu and Tonga. This makes sense. Labour mobility is becoming a serious business in the Pacific. A second was the presentation from the Government of Tonga. Tonga is already the best represented of the Pacific island countries in the two seasonal work schemes. Every year this tiny nation of 110,000 people sends about 13% of its population aged 20-45 to Australia and New Zealand to work on farms. There has been some speculation that such a high level of participation might be socially detrimental. But the Tongan representative told us that the government wants to double the number of seasonal workers it is sending, and is keen to address the problems that have slowed Tonga’s growth in recent years – most notably, that some of their workers have absconded, damaging the brand. 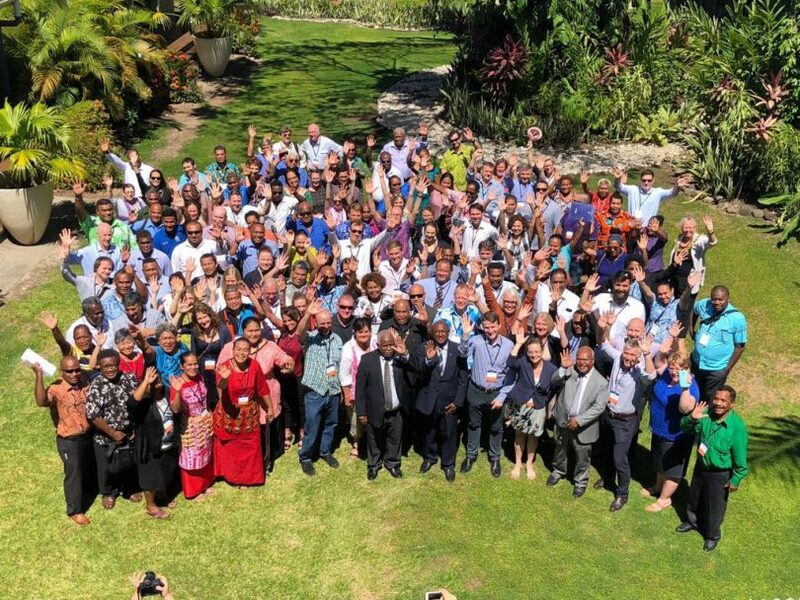 A third highlight was the presentations by smaller participants such as Solomon Islands and Fiji who are trying to make up for lost time, and boost their seasonal worker numbers through a revamping and strengthening of promotion and facilitation services. It’s encouraging to see this commitment, including from the host, whose Prime Minister opened the conference. It was also good to see a developing sense of competition. The PLMAM was, in that sense, something of a labour mobility slam. Fourth, on the sending country side there was a lot of discussion of superannuation. Seasonal workers are not required to be paid super in New Zealand but they are in Australia, and this adds to the administrative burden of the scheme for little value, with most seasonal workers not claiming the super that is owed to them. There’s no easy solution to the Australian problems (short of following New Zealand’s example, which is highly unlikely), but a number of creative work-arounds are starting to be canvassed. Fifth and finally, it was interesting to hear from the New Zealand delegation about their NZ Pacific Trades Partnerships, similar to but even smaller than the new Australian Pacific Labour Scheme. And there was much else beside. The first-hand accounts of employers are always fascinating. And there was interesting stuff on remittance costs, on workers’ health, and so on. So, that was the one, informal, interactive, information-sharing side of the PLMAM. But then there was the other, formal side, which actually began the day before with a caucus of the sending countries to identify their issues of concern, and ended with a country-only negotiating session to thrash out that consensus communique. Efforts by some Pacific island countries to complain about Australia’s proposed introduction of an “agricultural visa” were defeated, but text did survive to the effect that “Pacific island countries called on Australia and New Zealand to continue to give preference to workers from the Pacific.” A variety of specific issues were raised by sending countries, and the communique also urged the establishment of a regional labour mobility secretariat. It was an achievement of the host and the conference as a whole to produce a consensus document, but the abrupt change in tack from informal information exchange to formal negotiations does suggest some rethinking is needed. The advantage of a more formal approach is the potential for advancing agreements and solving problems together. The risk is a dead-boring meeting (and far fewer participants, if limited to only Pacer Plus signatories). We hope a middle-ground can be found. Perhaps a clearer demarcation of a half-day participating-country-only formal session at the end would be one way to go. And the earlier more informal sessions could benefit from more targeting and better preparation, with less “show and tell” and more dedicated sessions aimed at sharing the latest research and generating solutions to identified problems. Whatever the future holds, this PLMAM was a big improvement on the last, in Brisbane, especially from an Australian perspective. Our official delegation was perhaps the biggest of any country. It was good to have Department of Jobs and the Tax Office there as well as DFAT (both Canberra and from the various Pacific missions). This is perhaps indicative of the increased seriousness with which not just DFAT but the Australian government as a whole are viewing Pacific labour mobility. It’s fast becoming a cornerstone of our Pacific strategy. Next year’s PLMAM will be, according to the Arrangement, in New Zealand. We’re looking forward to it already. Arrangement on Labour Mobility: labour mobility relegated to the sidelines? How can Papua New Guinea gain more opportunities for seasonal work in Australia and New Zealand?